1960s Music – 1965 was a great year in music. The Beatles ruled the charts again but even with their five #1 hits there was plenty of room for some old favorites and newcomers alike. 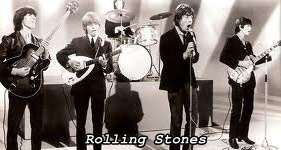 The Rolling Stones had one of the biggest hits of the year with “Satisfaction”, this song has been voted as one of the top five rock songs of all times. Possibly the last gasp for good old rock&roll was a song by Sam the Sham and the Pharaohs called “Wooly Bully”. It never hit #1 but it managed to stay in the Top 40 for over 14 weeks. Music was becoming more complicated and “Wooly Bully” was a throwback to simpler rhythms and lyrics. There was quite a lineup of newcomers in 1965. Sonny & Cher took a # 1 spot with their “I Got You Babe” even if it did sound suspiciously like “It Ain’t Me Babe” from Bob Dylan. The Byrds with an all star lineup would have a hit with a Bob Dylan tune, “Mr. Tambourine Man”. Their popularity would only last a couple of years, changes in members due to successful solo careers would eventually end the group. While they were together they are credited with creating the genre ‘folk rock’ along with Pete Seeger and Dylan, they also pioneered ‘country rock’ sounds as well as the beginnings of ‘psychedelic rock’. Their musical interpretations would influence music throughout the remainder of the 1960’s. Another newcomer was The Jefferson Airplane with Grace Slick, they didn’t have a chart success until 1967 though. Out of the San Francisco Bay area and not causing much of a stir until later years was a group that was eventually known as the Grateful Dead. Their pioneering in long musical improvisation gave rise to the musical term jamming. Roger Miller had the biggest Country & Western hit of the year with “King of the Road” proving again that there can be a cross over market for C&W. While folk music was turning electric Simon and Garfunkel had a more acoustic hit with “The Sound of Silence” which would hit #1 on New Years day 1966. In the grown-up world movie soundtracks were ruling with some all time greats like “The Sound of Music”, “Doctor Zhivago”, My Fair Lady”, and “Fiddler on the Roof” leading the way.